Bombus occidentalis is not your typical bee. For starters, unlike the many buzzing pollinators I observe in my organic yard or on the wildflowers lining the many trails I've hiked over the past year, I've never seen a Western bumblebee. And, while many of our native pollinators are in decline for a variety of reasons, this Bombus is especially rare. 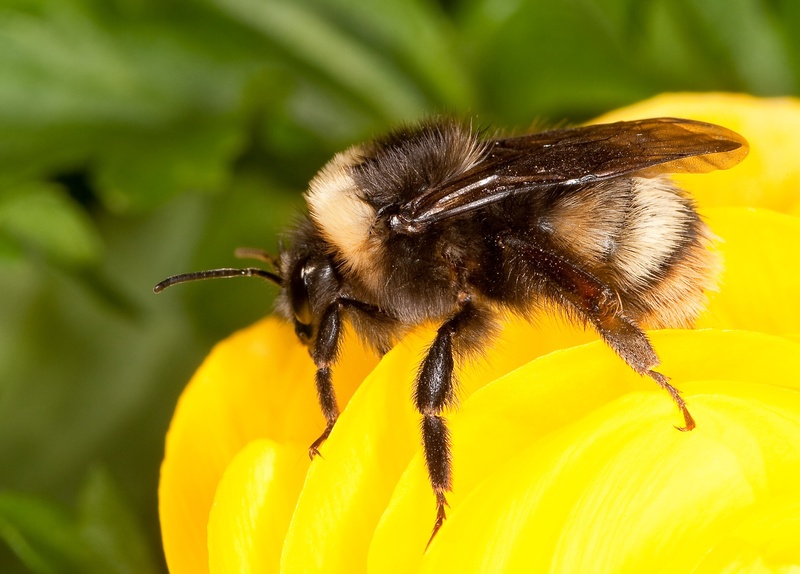 So rare, in fact, that scientists are now employing a host of citizen scientists to help them locate these solitary bumblebees so they can learn more about where they survive and why they are in so much trouble. A recent OPB story highlights some of this work, and I had the opportunity to tag along on a survey on a trip with the Great Old Broad for Wilderness. The Oregon chapters of the Great Old Broads for Wilderness recently met for a weekend of service projects and fun at Lost Prairie campground in the old Cascades. Several of us participated in bumblebee surveys, led by Willamette National Forest staff, to see if we could locate a Western Bumblebee. Ten of us headed to Lava Lake, which turns into a grassy meadow in the summer months covered with patches of spirea, aster, yarrow, and goldenrod. Our task was to net bees we saw, and to see if any of them could be identified as the bumble in question. I partnered with Jane from the Portland chapter, who captured a bee (not the desired Bombus occidentalis) almost immediately and was rewarded with a mild bite. She promptly offered me the net (haha). I was in the process of learning the names of wildflowers with Carol (Willamette chapter) and scientist extradinaire, when we heard excitement from our Forest Service chaperone several feet away. They had caught a bumblebee in a patch of purple asters, and thought it may be a Western. I provided the specimen jar Brett (our Forest Service guide) had previously given to me, and he delicately transferred the bee from the net to the jar. It took several minutes to capture the bee at the right angle to get a good view of the identification 'tell', which is a white, furry back end. Satisfied that we had documented our find, we released the busy bumblebee to continue, hoping it can help bring many more to this lovely meadow. While I didn't get to experience this lone sighting (out of 3 total sites surveyed in the area that day), I had a great time wandering through the native vegetation of this mountain meadow. These meadows are vital for bumblebees, which rely on the pollen and nesting areas there, but the forests surrounding this habitat are also an important component of the landscape. Conversion of native forests to over-simplified tree plantations, herbicide spraying on private timber land, fragmentation of habitat by roads and logging, and the suppression of fires that naturally kept meadows open are all having an impact on our native pollinators like the Western bumblebee. As scientists and citizens alike are learning about the importance of our native pollinators like bumblebees, we need to make changes in how we manage forests, meadows, and our own backyards. You can learn more with Beyond Toxics, and the Oregon Bee Project.